Sports Bars originally appeared in the January 2002 issue of Bon Appetit, and since discovering the recipe I’ve made them many times using different ingredients. 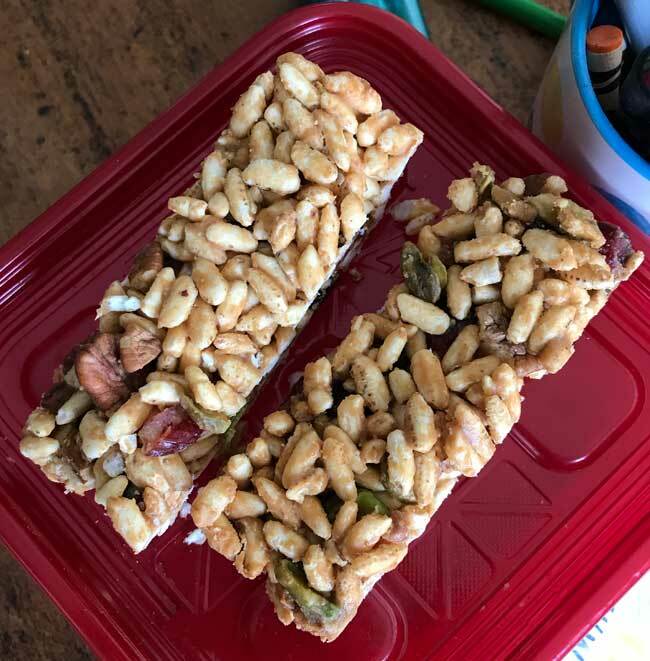 These days my usual version of Sports Bars is a combination of puffed rice, peanut butter, honey, dried cranberries and whatever other nuts are around. The original version recipe calls for a mixture of honey and corn syrup, but I’ve found that using all honey works just as well and the bars taste great — not too overly honey flavored. If you are not a honey lover or if you want to make these vegan, you could try using maple syrup instead or maybe use a combination of maple and rice syrup. One thing to be keep in mind is that the bars start out VERY crumbly. They will set, but it takes one of two things — patience or the freezer. I usually let mine cool for a few minutes, then throw the whole pan in the freezer for about half an hour. 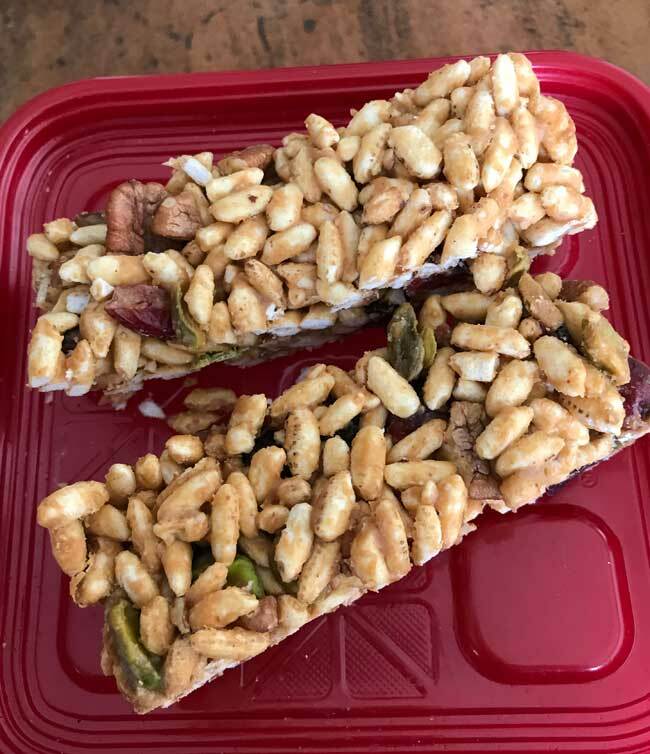 Sports Bars are snack bars made with cereal, peanut butter and honey. 1 1/2 cups puffed wheat or puffed rice cereal. Preheat oven to 350°F. Line a 9x5-inch loaf pan with foil and spray with nonstick spray (or just use nonstick foil). Mix cereal, pecans, cranberries and banana chips (or another kind of nut) in a large bowl. Combine peanut butter, and honey (or syrup) in a heavy small saucepan. Bring to a boil, whisking constantly until mixture bubbles vigorously and thickens slightly. Pour peanut butter mixture over cereal mixture in bowl; stir to blend. Transfer mixture to prepared pan. Press down tightly and bake for about about 8-10 minutes. Let cool completely, then lift foil from pan and cut into bars. Note: These will not hold together until they have cooled completely! If you want them to cool quickly, put the slightly cooled pan of bars in the freezer. Thanks! That sounds good – I needed a reason to try/buy Lyle’s golden syrup anyway! I finally spotted it at World Market a couple weeks ago. Hola, Amigo!Nope. At first I thought it might be to blame for why my bars were so crumbly right out of the oven. That is, I thought the corn syrup might have helped them stay together somehow. When they cooled, they held together just fine.If you follow the recipe as I wrote it and use 1/4 cup of honey, I think you’ll get a pretty strong honey flavor. So if you don’t like honey, you might want to tone it down by using a combo of corn syrup and honey. I didn’t want any honey flavor in mine, so I used 1/4 cup of Lyle’s Golden Syrup, which just tastes like caramelish sugar syrup. Next time, I might try a combo of honey and maple syrup or even caramel syrup. I think the most important thing is to just keep the proportion of thick syrups the same. I noticed in the original recipe that it also called for Corn Syrup – did leaving that out have any effects that you noticed?